Each year the foundation recognizes someone who makes an outstanding contribution to improving community health. Dr. George Gaston III won this year’s Spirit of Health Award recognizing his outstanding leadership and service to help improve the health of our communities. 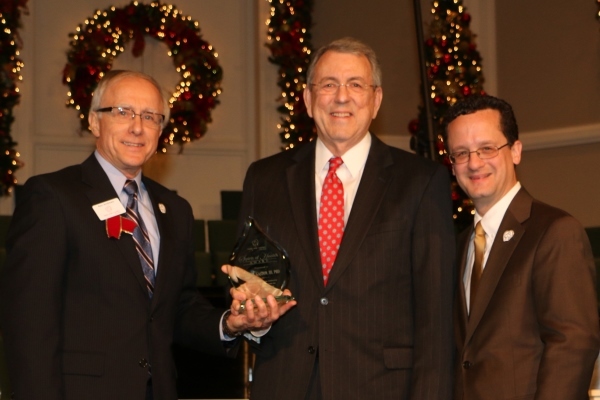 This year’s event is scheduled on Tuesday, December 10th, 4 p.m. at the First Baptist Church located at 515 McCullough Ave.
Gaston’s accomplishments over his ministerial and professional career include earning a BA from Baylor University and a Masters and Doctorate from Southwestern Baptist Theological Seminary. Gaston began his ministerial career in 1965 at the Western Heights Baptist Church in Waco. He held pastorates in Hamilton, Houston, Abilene, Corpus Christi, and Monroe, LA. He held 10 interim pastorates including Baptist Temple Church in San Antonio. Gaston has been on the faculty of Southwestern Seminary and Hardin Simmons University. Gaston entered the healthcare ministry area in 1997 when he became Assistant Vice President at Memorial Hermann Healthcare in Houston. He came to San Antonio in 2003 to serve as the Regional Vice President of Mission and Ministry at Baptist Health System. George retired this last August after 10 years of faithful service. Gaston has served on the boards of trustees of countless organizations including San Antonio organizations such as Faith Family Clinic and Palmer Drug Abuse Program. Gaston led a very important spiritual program after the Baptist Hospitals were sold to Vanguard Health Systems in 2003. He led and managed the Christ-centered mission of the system which included the chaplains, chapels, and the clinical pastoral education program. His leadership in not only the health system but in this community has changed lives. Gaston and his wife Susan have two children and six grandchildren.